Marmalade. I love the stuff. I spread it thickly on hot buttered toast, stir spoonfuls in my porridge, spread it over joints of ham and use it to make the most gorgeously sticky cakes. What is the whole fruit method? Basically the whole fruit method involves cooking the whole fruit in simmering water for the best part of a couple of hours. The fruit is then juiced, shredded and cooked with sugar. Using this method gives a darker and less delicate result than the traditional jelly method, but it’s certainly less time consuming and is a good option if you’re short on time. Don’t get me wrong – this method isn’t completely hands off! You still have to shred the orange peel, but I find this kind of thing pretty relaxing – I make myself a cup of tea, switch on the radio or a good podcast and get slicing. How thickly/thinly you slice the fruit is a matter of personal preference – some people prefer long thin shreds, while others favour short, chunky pieces. 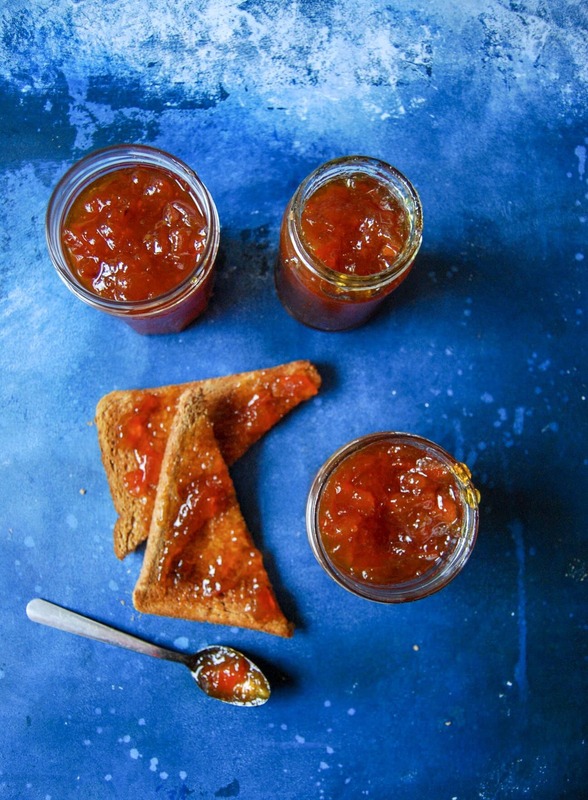 A shot of whisky, rum or Cointreau stirred into the marmalade before spooning into the jars is a great addition but of course, entirely optional. Make sure you sterilise your jars before using them – you can either put them in the dishwasher (using them as soon as the dishwashing cycle ends) or you can give the jars a good scrub in very hot, soapy water before rinsing them and placing them in a low oven at 110C/90CFan for about 10-15 minutes. You also need to fill the jars with marmalade while they are still hot. 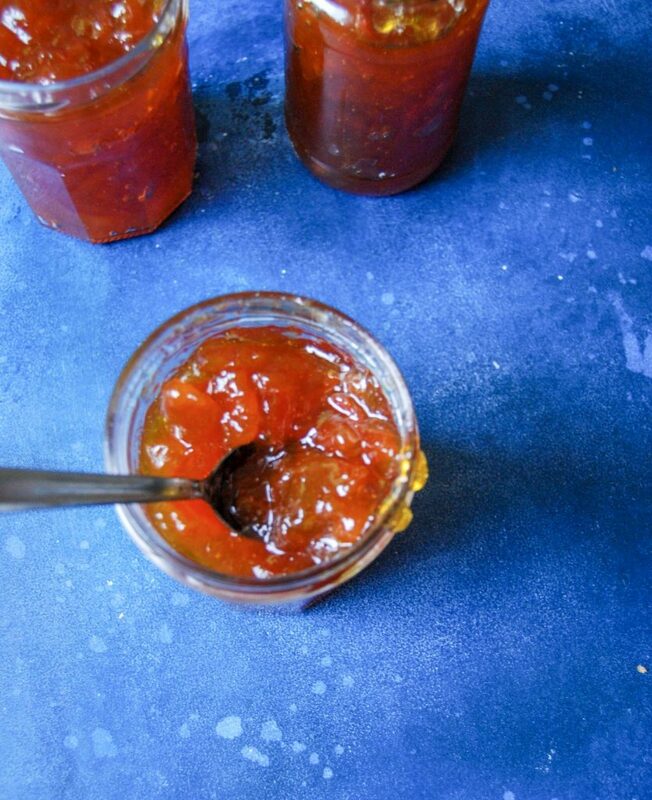 This will kill any lingering bacteria which can cause the marmalade to become mouldy. 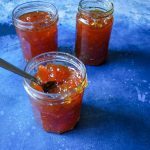 At the time of writing this post, Seville oranges were still in plentiful supply in my local greengrocers – so hopefully you’ll be able to get your hands on some before they disappear! This recipe was originally published 2nd February, 2015. Re-published 4th February 2019 with new photographs. 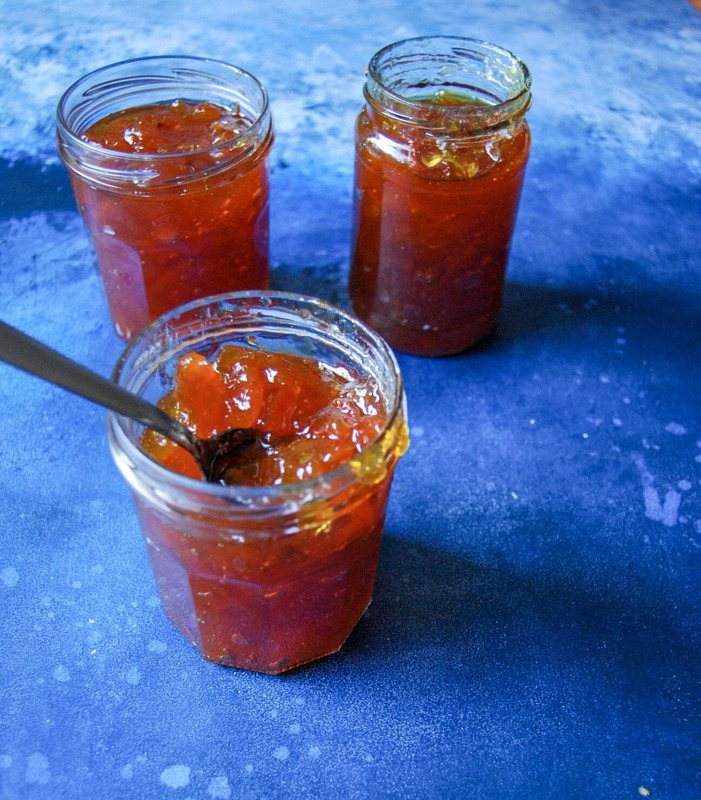 This easy Seville orange marmalade is made by simmering whole oranges - no straining required! Place the whole oranges in a large pan and cover with water. Bring to simmering point and simmer, covered, for 1 1/2 - 2 hours or until the oranges are soft. 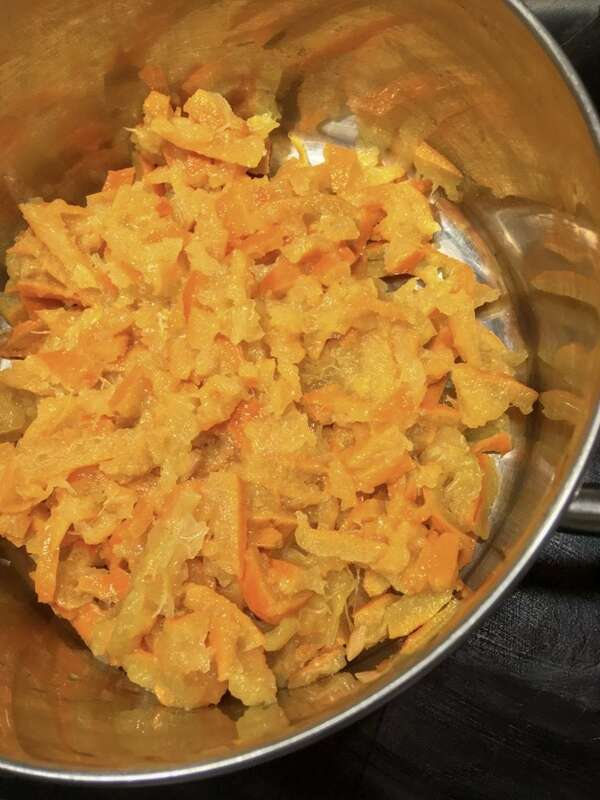 Using tongs, remove the oranges from the pan to a bowl. Tip the cooking liquid into a measuring jug. When the oranges are cool enough to handle, piece them and squeeze the juice into the measuring jug. Now slice the oranges, chopping the peel up to whatever thickness you desire. Discard the pips. The liquid should be 1.5 litres, so top up with extra water if need be. Pour into the pan with the lemon juice and sugar. If you don't have a thermometer, a good way to test it is spoon a little marmalade onto a very cold plate (I pop one in the freezer before I begin) and leave it for 30 seconds or so. Lightly push it with your finger and if it wrinkles slightly, it's ready. Take the pan off the heat and stir in the spiced rum or whisky, if using. 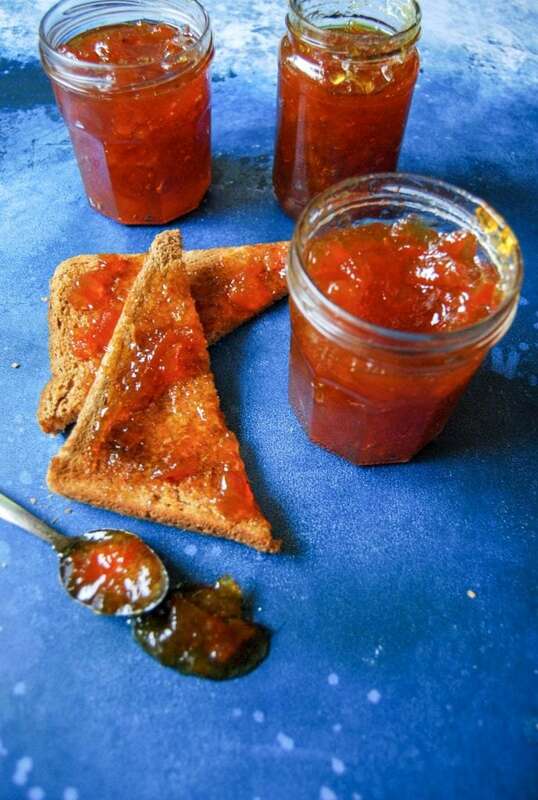 Leave the marmalade to settle for 15 minutes before pouring into warm sterilised jars, filling them right to the top. Cover the top of the marmalade with a circle of waxed paper and a cellophane cover. Screw the lids on the jars and leave to cool completely. Store the marmalade in a cool, dry place. If you've sterilised the jars correctly, the marmalade should keep well for a couple of years. 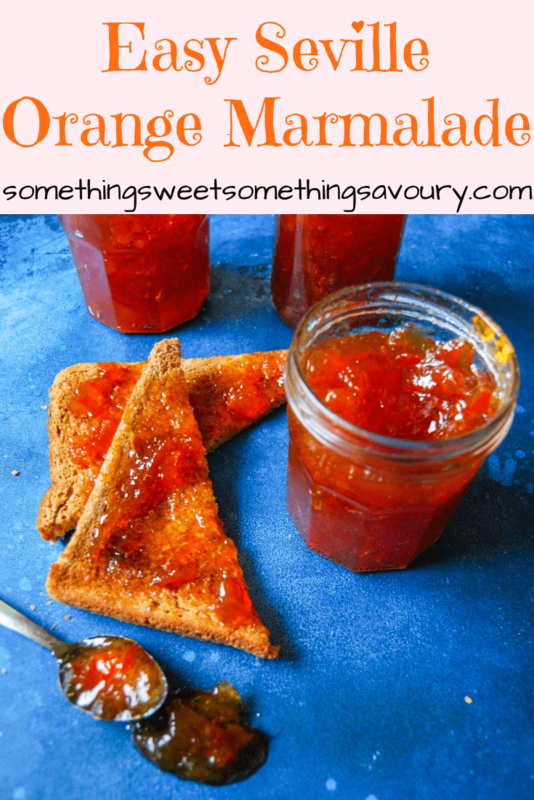 I can’t say I’m all too keen on marmalade (I don’t buy it let alone try and make it), but adding a touch of spiced rum seems like the perfect addition for my tastebuds! Sounds delicious. I love marmalade and this version seems to take it one level up. This looks gorgeous, and sounds even better! Seville oranges freeze well. Buy enough for another batch and put in the freezer. Who knows if we will be able to get hold of them next year, post Brexit.